Last month Mystikal's field percussion was selected to compose and record various percussion rhythms for Hollywood, Calif. production company Musikvergnuegen. 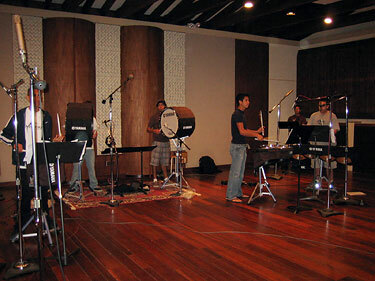 The ensemble spent four hours in the studio with the producer for Musikvergnuegen recording cadences, attacks, rolls and grooves to be used in various commercials and movies. "The guys were excited to have had a chance to work with professional sound engineers and the producer on this project," said Mystikal Director Rob Lowery. "Our percussion caption head Kurt Hensch takes the credit for composing these rhythms for the recording session." Lowery was honored to have Mystikal selected by professional producers to work on the project with the movie industry. "This type of positive exposure in the community is awesome for the organization," he said. "It allows us to educate the community about drum and bugle corps and show how important the activity is for developing well-rounded individuals that might continue in the music industry."